I paid 85€ for it which is a reasonable price for this OB in 2017. I noticed that many retailers price it over 100€ these days. I would NOT spend that kind of money for it. It's an easy-drinking daily dram and I like it but the old price of around 70€ was just right considering the quality that you get in your glass. Stock up on this as long as prices last under 100€! This is the first HP I ever tasted and to be honest what a surprise (it was a gift). Although not the most complexed whisky I ever tasted, for me it is perfect in the sense that it is exactly what I expect when I drink a whisky. It is completely balanced. It is powerfull yet smooth. It has multiple flavors but not overdone. I love it. Nose: sweet with spices, leather, oak, dried fruits, heather honey, raisin, berries, christmas cake, citrus, tangerine and very light smoke peated aroma at the background notes. Mouth: sweet with spices, dried fruits, oak, berries, raisin and very light peated smoke notes. Finish: long and sweet with spices, oak, leather, raisin, chocolate and citrus notes. 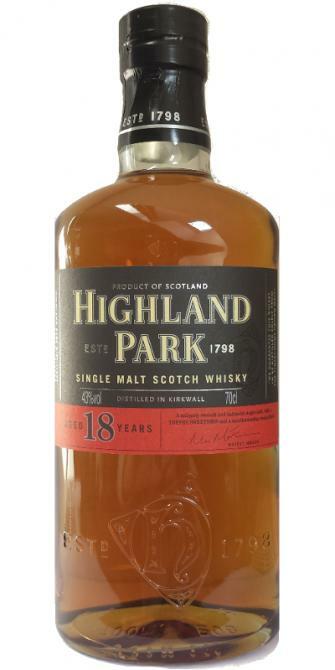 Highland Park 18YO is a very good balanced and tasty whisky. I like it very much. I gave 88 points. heather peat. Fruit salad apples. Light citrus notes. Very light and fresh nose. Great mouth feel. Mouth coating oloroso. Some bite from the oak spices pepper. Nice aftertaste. Sweet fruits, christmas cake, salt, dried fruits, red apples, heather honey notes on nose. Sweet fruits, raisin, light heather peated smoke, spices, dust, herbal notes on palate. Spices, oak cask, dryness, grass, heather peat notes on long finish. This whisky is a very tasty! A rather subtle blend of many things… Starting with smoky notes, fruity and honey notes and… Well, some “fat” notes (Grandma added a little bit more butter to his apple pie). Everything is pretty well dosed, without any note over the others. A good attack in the mouth but that remains sweet and rather fruity. The peat and smoke are coming after that, just what you need, without erasing the rest. Well balanced, like the nose. Sweet and slightly saline notes. A touch of almond paste, with a nice length. A rather subtle blend of many things ... Starting with smoky notes, fruity and honeyed notes and notes that I would call more fat (Bobonne added a little butter to his apple pie). Everything is pretty well dosed, without a note really taking over the other. A good attack in the mouth but remains sweet and rather fruity. The peat and smoke are then felt, just enough to not erase the rest. Nice balance, like the nose. Sweet and slightly saline notes. A touch of almond paste, all on a nice length.